What Else Can I Expect From an Online Certificate in Medical Coding Program? What Can I Do With a Medical Coding Diploma? Medical coding and billing personnel represent an increasingly important component of the healthcare system, and professionals working in these fields require vast knowledge of medical terminology, the insurance industry, anatomy, and information technology. You can advance your career through one of the online certificate programs for medical billing and coding, which will enable you to become certified in the field and work in a variety of settings within the healthcare industry. This is also a field that is experiencing a lot of growth, especially as baby boomers retire and new federal regulations mandate that healthcare providers keep thorough electronic medical records. In fact, the U.S. Bureau of Labor Statistics reports that medical coding and billing will see about 15% growth between 2014 and 2024 — a more rapid pace of growth than most other professional fields. Now is a great time to get your career started by exploring the wide range of accredited medical billing and coding online certificate programs available. Introduction to Anatomy: This course takes an in-depth look at anatomy and physiology, including how various functions and systems within the body work in conjunction with one another. It offers a sound foundation that proves useful in just about any position in the medical coding field. Introduction to Health Insurance: Medical coders must deal with insurance companies on a daily basis, and this course provides a foundation of the health insurance system and how it interacts with hospitals, nursing homes, and clinics. Students learn about insurance statistics, various types of insurance, and reimbursement methods, among other topics. Advanced CPT Coding: This course enables students to become familiar with procedural coding, a skill they'll need for any medical billing or coding position. 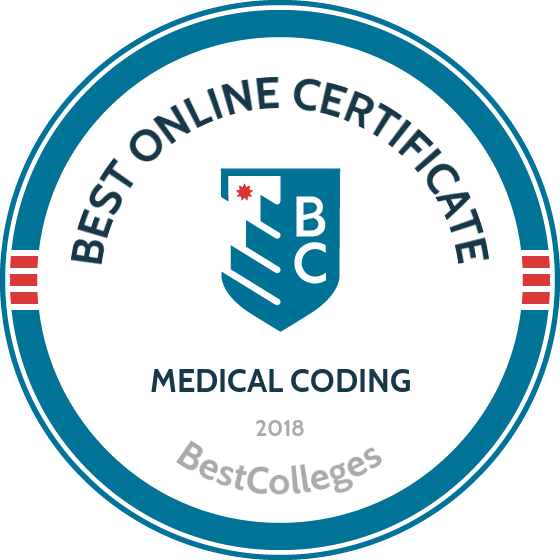 Medical coding online certificate students explore basic coding processes, how to code special surgery cases, radiology coding, and more. Introduction to Medicare & Medicaid: In this course, online medical billing certificate students learn about the fundamentals of these two federal entitlement programs. These are especially important subjects if you plan on working in a nursing home setting, or for a healthcare facility that works with low-income people and/or senior citizens. HOW LONG DOES IT TAKE TO GET AN ONLINE CERTIFICATE IN MEDICAL CODING? Today there are many different medical billing and coding certificate programs online, and students usually take one or two years to complete certificate requirements. The amount of time it takes you to finish out your program depends on several factors, including whether you are able to take courses asynchronously and if you can attend classes part time or full time. It's also worth exploring whether the programs you're considering allow you to work at your own pace or require you to take classes within a cohort of your fellow students. If you can work at your own pace, you may be able to expedite your studies and finish in fewer than two years. On the other hand, cohort learning provides you with the benefit of getting to know your fellow students and the ability to work together on assignments and projects. Most online medical certificate programs require 18 to 30 credits to graduate. Drexel has a reputation for interdisciplinary and career-focused online programs and offers over 45 professional certificates. The certificate in medical billing and coding is a six-course program that's offered through the College of Nursing and Health Professions. It's designed to prepare students for entry-level employment. In addition to earning a diploma, graduates are prepared to sit for several national certification exams that are offered through the APPC, American Medical Billing Association, and the American Health Information Management Association. Most students complete the medical billing and coding certificate online in about one year. The certificate in medical coding from Charter Oak combines a medical coding curriculum with a medical science foundation and is ideal for existing health care professionals or those looking for a career change. The program requires learners to earn 21 credits. Students learn how to code patient data using cutting-edge software, improve the patient reimbursement and data collection process, and identify potential ethical or compliance issues related to coding and reimbursement. Students must earn a minimum grade of C in all seven courses in order to earn their medical billing certificate online. Students enrolled in Minnesota West’s medical coding specialist diploma program learn how to properly apply diagnosis and procedural codes to patient records and work with other health care practitioners to ensure that medical records are complete in their documentation. This medical coding certificate online can be completed as a stand-alone diploma or can complement an AAS in the medical secretary profession. Students complete 34 credits over a recommended three semesters. The final semester includes an advanced coding class and a board review of a student’s program achievements. Students are advised to have some familiarity with computers, spreadsheets, and word processing applications. Hutchinson offers a healthcare coding specialist certificate to nontraditional students and professionals looking for an affordable and flexible opportunity to expand their credentials. This online medical billing certificate consists of 45 credit hours. A suggested sequence of about 15 credits per semester allows students to finish their certification in less than one year. The curriculum provides a foundation in health record applications and processes and human anatomy and physiology in addition to advanced courses in coding and a health record coding practicum. Certain classes are not available every semester, so students should work closely with an adviser to organize a program of study. Dakota State University offers a healthcare coding certificate. It's one of the leading online certificate programs for medical billing and coding, and DSU’s curriculum is developed around International Classification of Diseases and Current Procedural Terminology industry standards. Graduates are prepared to become medical coders or to pursue an associate or bachelor’s program in areas such as health IT and health information administration. Online courses are asynchronous. The certificate of applied science in medical coding and insurance billing is offered through MSU’s City College and prepares graduates for entry-level roles in the field. MSU has one of the best completion rates for medical billing and coding certificate programs online, with 80% of enrolled students completing all certificate requirements on time. The curriculum provides students with knowledge of how to accurately analyze medical records and code diagnoses and treatments based on international and national standards. Graduates are equipped with basic knowledge of human anatomy and are versed in the latest billing software. Students who are located in a Western Undergraduate Exchange member state receive discounted tuition. Community Care offers a medical billing and coding diploma that can be completed by full-time students in less than 12 months. Graduates are prepared to sit for the certification exam. Students learn about creating a career path and how to move into management-level positions. The medical billing and coding online certificate curriculum includes courses in medical terminology, human anatomy, healthcare software technology, and coding for diagnoses and medical procedures. Online courses are asynchronous and students have access to instructors through multiple mediums, including Skype, email, and text. Graduates of Southwest Wisconsin’s diploma in medical coding specialist program are prepared for entry-level positions in a wide range of health care settings, including surgery centers, community clinics, and home health care agencies. The medical coding online certificate curriculum requires students to complete a minimum of 32 credits. Course topics include healthcare law and ethics, healthcare reimbursement, and intermediate and advanced diagnosis and procedure coding courses. Applicants should provide official high school and college transcripts and college-entrance exam scores for course placement recommendations. Basic computer knowledge and familiarity with biology is useful. Wisconsin Indianhead Technical, a provider of one of the most comprehensive online medical certificate programs in the midwest, offers a competitive annual tuition for all distance learners. This technical diploma in medical coding specialist can be taken as a full-time or part-time program, and graduates are prepared to transition into the college’s associate program in health information technology. Students learn how to assign procedural and diagnostic codes using national and international coding systems used in healthcare claims and areas like medical research. A program orientation is required before students can enroll in classes. Collin County offers a medical billing certificate and a medical coding certificate online. While the two are offered separately, they’re designed to be taken at the same time or in sequence. The certificate in medical coding requires about eight months of sequenced courses, including computers in the medical office, medical coding, and pathophysiology. Students are encouraged to take two courses at a time to finish the degree on time. Graduates are prepared to sit for the certified professional coder exam through the AAPC. Peirce offers a certificate in medical coding that provides graduates with the skills and knowledge needed to help support patients by ensuring that their medical records are properly coded accurately and promptly. Students follow a curriculum that aligns with the ICD-10 coding system and also learn other essentials in courses like medical terminology and health information and delivery systems. Graduates who have earned their Pierce medical coding online certificate are prepared to take the certified coding specialist (CCS) exam, which is offered through the American Health Information Management Association (AHIMA). Minnesota State’s medical coding and insurance diploma program teaches students the necessary medical service billing knowledge to become successful in the field. The curriculum requires the completion of 50 credits in advanced classification and coding for medical diagnoses and procedures. Other courses include training in health care insurance, financial processes, and billing regulations; law and ethics in health care settings; and knowledge of the human body structures and functions. Minnesota State caters to first-time college students and adult learners, with about half of it student population between the ages of 19 and 29. A diploma in medical coding specialist from Alexandria Technical requires 45 credits, which can be completed over four semesters (about one year). In addition to learning specialized knowledge in areas like health care systems and practices, advanced coding, and medicolegal and reimbursement, students learn basics like computer and job keeping skills. Graduates are versed in using and understanding medical terminology and in applying the latest coding standards in a wide range of medical facilities. Introduction to computers or a similar course is required for entry into the medical coding certificate online program. Great Basin’s accelerated certificate of achievement in medical coding and billing can be completed in two semesters. The program begins each fall. GBC offers collaborative online courses with Career Step, an online career training school based in Springville, Utah. The 34-credit curriculum includes training with using the CPT, HCPCS, and ICD-10 standardized coding systems. Graduates are able to file basic insurance claims and use medical billing software systems. Students must earn at least an 85% or higher in all courses in order to earn their online medical billing certificate. North Dakota State offers one of the top accredited medical billing and coding online certificate programs in the midwest. The program prepares students for success in handling sensitive medical data. The medical coding certificate trains students in and outside of the classroom, with two blended professional practicum experiences required in the field and in virtual labs. North Dakota works with students to find a professional site that is close to their hometown. Online courses are asynchronous but follow the same schedule as the on-campus academic calendar. Students who earn their certificate in medical coding through Fisher are trained to apply their specialized medical coding skills within a range of health care settings, including hospitals, surgery centers, and insurance companies. A 37-credit curriculum allows students to develop the knowledge and skills necessary to apply standards-based codes to medical records as well as communicate with other healthcare professionals. Course subjects include the study of disease, health information technology, and essentials of pharmacology. Students who can provide proof of high school completion or a GED diploma are automatically admitted to Fisher’s medical coding online certificate program. Barton County offers one of the best accredited medical billing and coding online certificate programs in Illinois and provides students with training in ICD-9, HCPCS, and CPT coding systems. Graduates of the certificate in medical coding program have the skills and background knowledge necessary to perform successfully in an array of medical and professional settings. The 44-hour curriculum can be completed over three semesters with a full-time course load, which requires students to take about five courses per semester. Coursework includes a foundation in computer applications. Moraine offers its medical coding specialist diploma on a part-time and full-time basis. Graduates are equipped with the skillsets needed to enter the medical coding field or continue in a related associate program, such as health information technology. Wisconsin residents receive a 34% discount on per-credit tuition rates. Tuition is also affordable for out-of-state students who want to enroll in one of the region’s top online medical certificate programs. Students learn how to use universally-recognized medical codes, handle payments for health care claims, and collaborate with physicians and insurance companies. GCC offers a medical coding and billing specialist certificate that prepares students for entry-level medical coding and billing careers in healthcare organizations of all sizes, including community clinics and major health insurance companies. Students who earn a minimum grade of C in all coursework are awarded their medical billing and coding online certificate. Most students complete the 42 required program credits in two years. Program requirements include foundational and advanced courses. During the fourth semester, students take ambulatory care coding and a two-credit internship. Weber State’s certificate in healthcare coding consists of 10 courses. Graduates are prepared to sit for the Certified Coding Associate (CCA) exam. A suggested course sequence includes an average of two courses taken per semester, with the exception of four courses — including a professional practicum — in a student’s fourth and final semester. Students must earn a minimum grade of C in all courses. Applicants must also have earned a minimum high school GPA of 2.0 in order to qualify for Weber’s medical coding certificate online program. No prior college experience is required for this program. Lakeshore's medical coding specialist diploma provides students with many career opportunities. Students receive the skills training to work in hospitals, clinics, assisted living, and nursing home facilities, or in corporate and government settings. The 30-credit program includes coursework in health data management, applied coding, and digital healthcare literacy. Students also take foundational courses in anatomy, physiology, and medical terminology. Returning students may be able to earn credit for prior work experience or training. Columbus State offers a hybrid certificate in medical coding, which includes some required on-campus lab visits and a required on-site practicum experience. This accelerated program consists of 22 credits, with a suggested course sequence that spans three semesters. Students are trained in CPT, PCS, and ICD-10 coding standards. Students interested in applying for this medical coding online certificate must have completed high school or earned their GED. Applicants must also complete their health information management technology technician certificate, which is available through Columbus State. First-time or returning students learn the essentials of procedural and diagnosis coding through Northwest's certificate in medical coding program. The curriculum focuses on coding for medical offices in support of the insurance claims process. Graduates are prepared to take one of several national coding certification exams. Students may be able to earn some credit toward certificate requirements for prior professional or military experience. The same affordable per-credit tuition rate is offered to all online learners, regardless of residency. Applicants are encouraged to check with their home state’s licensing board to ensure that the certificate meets their state’s requirements. Ogeechee’s certificate in medical coding curriculum equips graduates with the skills needed to take one of several national exams offered through the American Health Information Management Association. This includes the CCS, CCA, and CCS-P (Certified Coding Specialist, Physician based). Students can begin the program during any semester. Learners must complete at least 24 credits in anatomy, medical billing and coding, and other coursework in order to earn their certificate. Average program completion time is two semesters. Applicants must be at least 17 years old and have achieved qualifying scores on a college-entrance exam. The medical coding diploma from DCB offers an accelerated pathway which can be completed in one year. A minimum 2.5 GPA is required in all core courses in order to participate in an on-site, cooperative education experience. Students learn about industry computer programs and fundamental knowledge of diseases. This teaches them how to assess and select the most accurate diagnosis and procedural codes for medical records. DCB is also flexible in comparison to many other online medical certificate programs, offering students the choice of taking all online courses (with the exception of the practicum) or a mix of online and on-campus courses. A certificate program is different from an associate degree in that it generally only requires that you complete courses related to your professional area of study. On the other hand, an associate degree program usually involves more general education credits that can be applied to a 4 year degree later on. Although it's not always the case, some employers prefer to hire individuals who have an associate or bachelor's degree rather than those who solely hold a certificate. Medical Coder: Working with electronic health record systems, medical coders enter data and analyze medical and surgical reports to apply the associated codes. They must be good communicators and able to work well with healthcare professionals and patients alike. Medical Biller: These professionals are responsible for accurate data entry and submitting insurance claims, as well as following up with insurance companies, healthcare providers, and patients to ensure timely payments of claims. They also manage invoices and accept payment and investigate when a claim has been denied. Health Information Technician: These professionals collect patients' health data and record it, typically using EHR software. They also review insurance claims and ensure full compliance with all relevant laws and regulations as they pertain to the handling of patient information. Earning a medical coding certificate online is a great step forward, but you may wish to move on to a bachelor's degree program in the future. Doing so qualifies you for a wider range of jobs in the healthcare field, including health information management and healthcare administration. In fact, many medical and health service managers make more than $90,000 per year with only a bachelor's degree. Health Information Management: This bachelor's degree program will prepare you to develop and oversee various health information systems, ensuring they are compliant with all medical, ethical, and legal standards. Professionals in this field may work in hospitals, clinics, nursing homes, or public health offices. Healthcare Administration: Healthcare administrators manage the business side of the medical industry, with a focus on office management, the delivery of health services, and health informatics.Health care administration is a high-demand field in which professionals earn competitive salaries. Bioinformatics: Bioinformatics is a very specialized bachelor's program that deals with the wide variety of healthcare data produced due to the rapid evolution of technology. Coursework tends to focus on statistics, life sciences, and computer science. Public Health: This bachelor's degree program focuses on health policy and how it contributes to the overall wellbeing of populations across the country and around the world. Many programs focus on the research and science aspects of the field, including biostatistics and epidemiology. Regional accreditation is considered more prestigious, although nationally accredited programs tend to have lower tuition rates. Accredited medical billing and coding online certificate programs must go through a stringent process that examines the quality they provide to their students. Programs that fail to adequately prepare students for careers in medical billing and coding will not receive accreditation. In general, the accreditation process for certificate programs works the same as it does for associate, bachelor's and master's degree programs. Derived from Payscale, listed below is salary information for various positions within the medical billing and coding field. Note that exact salaries depend on both where you work and how much experience you have. The Professional Association of Healthcare Coding Specialists maintains a robust member support system and communications network that helps professionals learn and grow in their careers. Its focus is also on improving documentation, compliance, and reimbursement practices in the field. This organization boasts more than 160,000 members and offers a variety of resources, including free webinars, job-finding services, and access to industry thought leaders. The AAPC also offers professional development opportunities and savings on a variety of professional and leisure products. The American Medical Billing Association provides educational and professional development opportunities, along with networking events and an annual conference (held each fall). It also offers advice on regulatory issues and the ability to share knowledge among members. There are numerous resources available to help you pay for your medical billing certificate online program. To start, take the time to fill out the Free Application for Federal Student Aid (FAFSA) form to determine if you qualify for subsidized loans, grants, or work-study benefits. You should also explore scholarships, especially those made available by hospitals, foundations, and insurance companies.